Containing a higher concentration of our innovative plant-based EGF, the BIOEFFECT EGF EYE SERUM works in tandem with the BIOEFFECT EYE MASKS to encourage maximum absorption of EGF. The treatment reduces puffiness and the appearance of tiredness while restoring tone and firmness to the eye area. Restores radiance and firmness to the eye contour. Reduces signs of tiredness and under-eye puffiness. 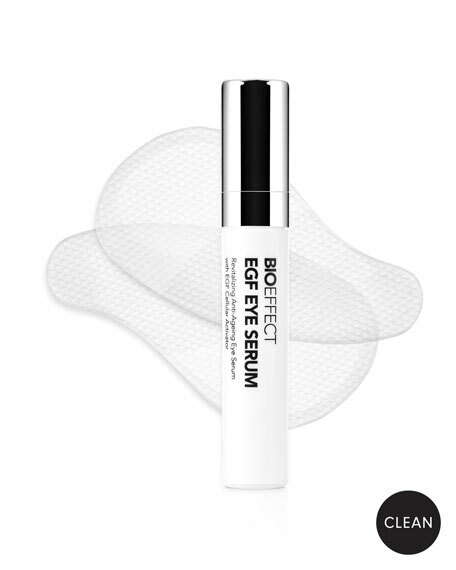 Use your fingertips to gently massage the BIOEFFECT EGF EYE SERUM into clean skin under the eyes. Carefully open the BIOEFFECT EYE MASK sachet and place one mask under each eye. Let the skin absorb the serum for 15 min. Remove and gently spread any remaining serum around the eye area. This skincare was founded by three geneticists who spent ten years studying plant proteins for medical research. They discovered a way to bio-engineer a plant-based replica of EGF, a naturally occurring human protein, in barley. The result? Skincare with Bioeffect EGF that hydrates and helps improve tone and elasticity. This refreshing, tech-inspired Eye Mask has been designed to combat discernibly tired and dull under eyes, utilizing a clinical advancement? ?Hydrogel.